Mon.-Thu. 11 a.m.-8 p.m.; Fri.-Sat. 11 a.m. -9 p.m.
Changes are afoot on the Central North Side. Some are big, like the transformation of the Garden Theater into someplace welcoming to all. Others seem smaller, like the disappearance of two-thirds of an idiosyncratic trio of hot-dog joints that for decades were located side by side by side on Federal Street. 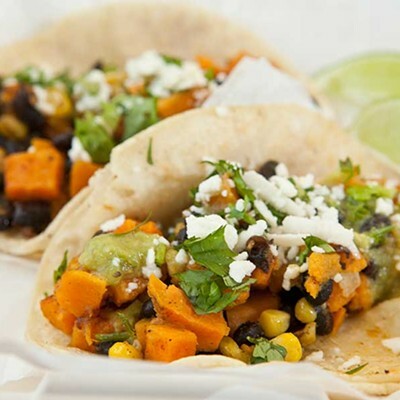 We were sad to see them go, but now welcome the broadening of handheld meal options: The last survivor is now flanked by a Jamaican takeout place, while another has been replaced by El Burro Comedor, a taco and burrito shop in the tradition of sunny Southern California. Actually, to call it a "taco and burrito shop" is a bit reductive. 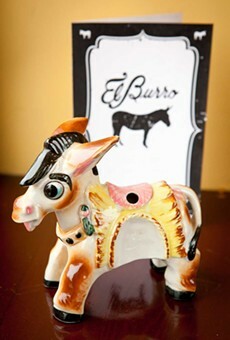 El Burro has crammed a lot of atmosphere into a tiny space, and a lot of Cal-Mex flavor into a deceptively brief menu. 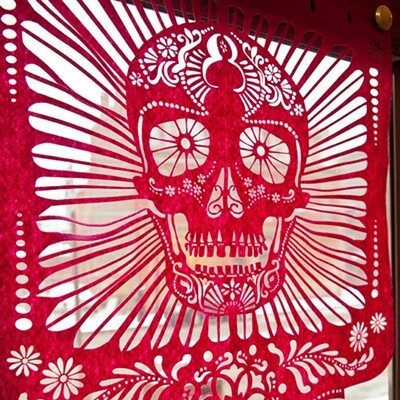 Owners Derek Burnell and Wes De Renouard, both San Diego natives, worked with a Bloomfield artist to create a classic, colorful hand-lettered menu board and a big Dia de los Muertos skull painting. Along with sunny walls and lacquered-wood counter seating, these create a casual, but far from careless, vibe. Meanwhile, tacos in three forms (hard, soft and taquito, or rolled), plus burritos, multiplied by several different fillings, equaled a tantalizing array of choices. A third menu heading, "Other," added such assimilated Mexican snacks as nachos and quesadillas, plus Cal-Mex specialties carne asada fries, Tijuana dogs and chilaquiles. In short, El Burro is not so much an expanded taqueria as a stripped-down restaurant, offering as much fork-and-knife fare as quick, handheld meals. But if you go for quick, handheld meals, you'll probably be happy. These do not include taquitos: These crisp-fried tubes are served beneath avocado salsa, pico de gallo and cheese, for a plate that is delicious, but not very portable. 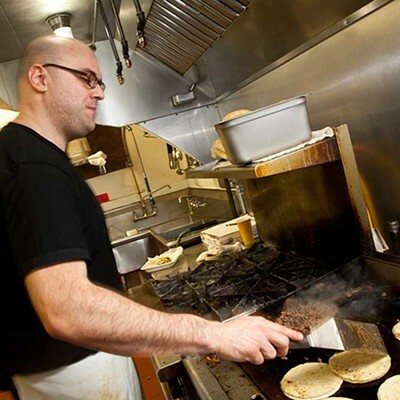 Soft tacos are available in corn or flour tortillas, the former served authentically doubled up, with the outer tortilla lightly crisped on the griddle. The meat fillings included the classics: shredded beef and chicken, chorizo, carnitas (roasted pork), and carne asada (chopped steak), plus potatoes, mahi mahi and shrimp. Toppings were simple and authentic: onions and cilantro, plus a little salsa (or salsa verde, in the case of our asada). 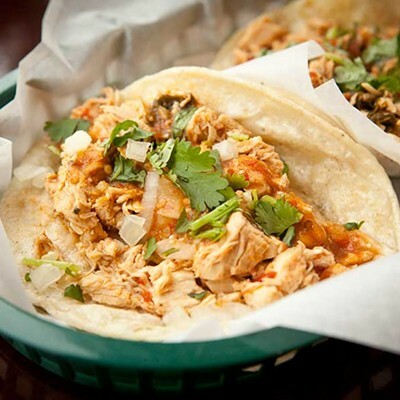 We found price and quality of El Burro's tacos to be comparable to those of other contenders in Pittsburgh's newish crop of taquerias, even if the steak was a little chewy. Burrito choice was equally exciting. 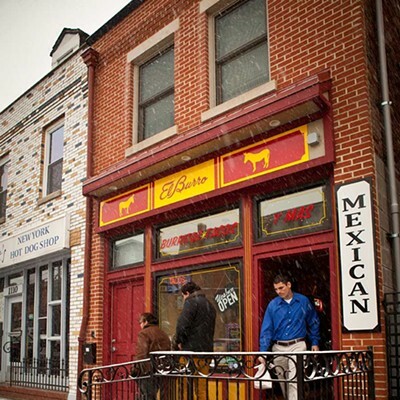 Alongside classic filling formats such as breakfast (egg, cheese and chorizo) and rice and bean, El Burro offers chile relleno, shrimp diablo verde and a "California Burrito" which — filled as it is with steak, fries and guacamole — seems like it could just as well be named after Pittsburgh. (As it turns out, Californians have been putting fries in their burritos for decades, making this adaptation well suited to local import.) We had the chile relleno burrito, in which a tortilla was lined with refried beans and filled with a roasted poblano pepper, itself stuffed with rice and cheese. This construction had the advantage of excellent ingredient distribution, as well as a pleasingly layered flavor profile. Carne asada fries were essentially loaded nachos with fries swapped for the chips. 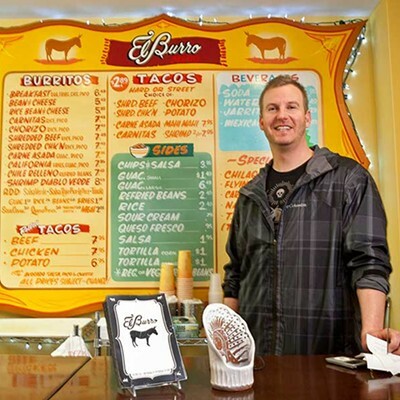 In El Burro's case, they were loaded with good things: not only plenty of steak, but also shredded cheese, pico de gallo, guacamole and sour cream. The thin and crispy fries made for a delightful interplay between rich and creamy toppings and the dish's crunchy base. Chilaquiles is a sort of homey casserole of tortillas, salsa and cheese which is not often seen on fast Mexican menus, at least not in our region. Having been baked in salsa, the chips were decidedly not crunchy, but served as a mildly corn-flavored, substantially textured base against which El Burro's excellent, and distinctly spicy, salsa verde stood out. 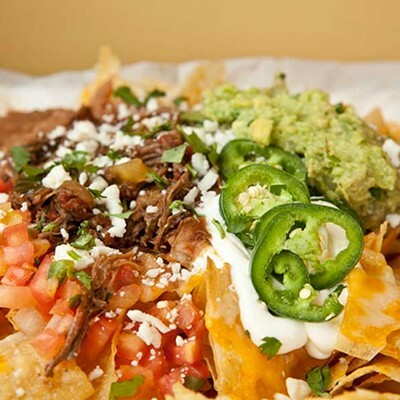 A la carte toppings like tomatoes, beans and meat (queso was already included) allow diners to push this hearty dish in whatever direction they prefer. The Tijuana street dog is another California innovation that seems uniquely suited not only to Pittsburgh food culture, but to the particular past of El Burro's own storefront. 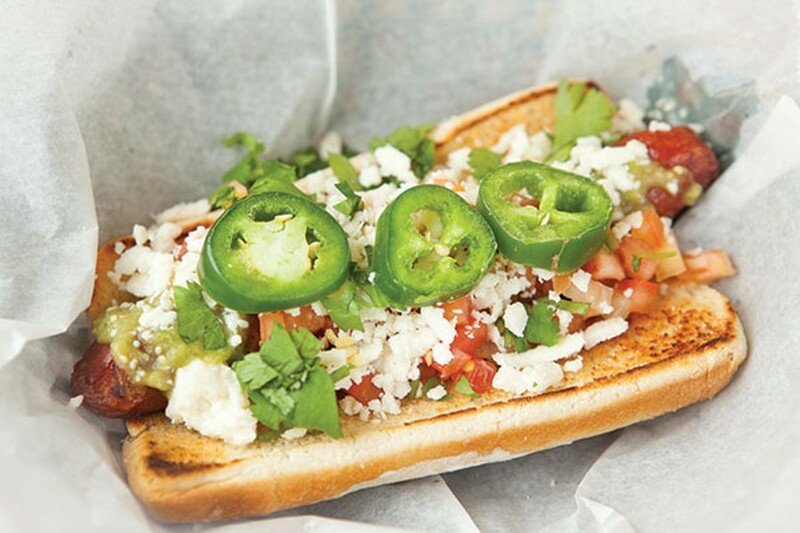 We loved this delicious — and fiery — combination of all-beef wiener, crisp bacon, pico, queso and paper-thin slices of jalapeño. From East Coast to West and back again, the humble hot dog has come a long way: We welcome its transformation, along with that of the neighborhood in which it's served.